This is displayed in Search Results. Please do NOT use quotation marks. Your name MUST match your Photo ID. Please use your full name, first or given name and last name (surname or family name). Your name appears at the top of your Profile Page. How many WWOOFers can you accommodate at a time? Please select your State. This is a required field and must be selected to enable saving anything else on this page. fThis will allow your profile to be included in searches. G'day we are operate a working cattle property in the Mary Valley South East QLD, just under 2 hours from Brisbane. We are on 1300 acres and we run 500 head of cattle . We operate a farmstay business for backpackers and locals to come share our way of living. We do horse rides, farm tours, kids farm animals have a recreational room including pool table, darts and mechanical bull, swimming in the rivers and have wildlife running throughout the property. The farm is 100ha on the Orara River, 25 km south of Grafton, producing tea tree oil, timber and some garden fruit. Abundant wildlife, kangaroos at the house, swimming in the river. Work includes weeding, fencing, tree planting, machinery operation, building.& garden work. I am an eco-professional & sometimes work off farm so WWOOFers should be flexible but can also help with wildlife studies. Accom for 1-3 people in my home depending on space or camp. NSI. Can P/U from bus, train or airport. Our beautiful lush valley is abundant with wildlife, creeks, dams and surrounded by bush ! Permaculture principles apply with the growing of our food, nourishment of the land, animals and ourselves. Located near Fremantle the Centre/Ashram offers daily yoga classes, spiritual discourses, daily guided meditation and is regularly visited by Yoga Teachers. This historic community house has a spiritual library, organic vegetable garden and beautiful grounds. Work includes maintaining the gardens and a range of karma yoga duties. Work schedule is: 5 hours per day, 5 days per week, two days free time. Minimum stay is 2 weeks. Strictly vegetarian meals. This Centre/Ashram is meat, alcohol, tobacco and drug free. Those who wish to investigate or deepen the yogic path are most welcome. Coquon Farm is a small (90 acre ) property on the banks of the Hunter River just north of Maitland, NSW. Reclaiming paradise, a once weed infested cow paddock is being lovingly transformed into native habitat & permaculture haven.Koalas, echidnas, wallabies & birds aplenty.. Currently building an adobe style sweatlodge from mud & hay. So much fun if you like mud! . A 1.5km pleasant walk or bike-ride from town. Accomodation in house, or plenty of room for camping. Work incl. mulching,building, weeding, planting etc. WiFi, Bicycles, Mainly vegetarian meals. We live on 280 acres, with 1 of 2 sons & small dog, nestled under the highest peaks of the Grampians National Park, 20 kms south of Halls Gap. We operate the Grampians Paradise Camping & Caravan Parkland, a beautiful, small camping ground with shady trees, gardens, small lake & wetlands. Native birds, animals & frogs abound. Bright starry skies. Work with us on environmental projects, fencing, gardening, maintenance, personal vegie garden and fruit orchard, firewood collection, ground works, jobs about the camping ground, occasional building projects (Aidan is very into Traditonal Timber Framing and nearly always has a project on the go). Caravan accom for 1-2 people with own cooking facilities and the use of the camp kitchen and amenities in the camping ground. Require own bedding. Campground amenities building has bathrooms and laundry. No children. Some independent cooking and possibly some shared meals with family. Prefer No Smoking, and No Smoking Indoors under any circumstance. Can pick up from public transport at Pomonal (bus Tues, Fri and Sun), Ararat, Stawell or Halls Gap (V Line Services - train and bus). See photos on our website. PLEASE NOTE: we have chemically sensitive family members, so will ask that no perfumes/fragranced products or scented washing powders, deodorants or shampoos are used before coming into our home. We are happy to provide unscented laundry powder, shampoo & soap as well as any advice. Please note that some essential oils are okay, but please speak with us before using them. Having transport is a huge advantage in this location as there is no immediate public transport, and many of the bushwalks in the Grampians require a trip in the car to access start points. Having said that the new Grampians Peaks Trail, a 13 day trek through the Grampians will be passing within walking distance of our property, so at some time in the future there will be great access to this incredible walk - we will upate this note once they open the Redman Bluff section of the Peaks Trail. Hi and thank you for reading our profile. Our beautiful cattle farm is set in the picturesque Eurobodalla Shire. We raise Angus/Friesian cows, our herd usually runs at about 35 cows, heifers and steers. We have one lovely Limousine bull who loves our girls and gives us beautiful calves usually in July/August if we get the timing right! We use a strip feeding method allowing the cows to graze in a given area for a day or two before moving them into the next "strip". This is done using electric tape and secure insulated poles for the tape to pass through once knocked into the ground. Not an arduous task at all and all part of stopping the paddocks from being trampled. We routinely inject our herd for intestinal worms etc. to keep them comfortable and prevent disease; we also drench them topically for lice. We have a stock yard, pens, gates and a cattle crush to enable safe handling when performing these tasks. We have approximately 30 free range chooks and a rooster which we feed twice daily with top shelf grain and left over vegetable and fruit scraps. Eggs are collected daily of course from their nesting boxes in their chicken coop and sold to local friends. The chooks have a very large area in which to peck and scratch, including a 3 tier orchard of fruit and citrus. We grow as many vegetables as we can in our netted 3 tier vegetable garden using cow, chicken and horse manure for fertiliser. We have a small compost heap but are in the process of purchasing materials to build a 3 bay compost area, sufficient for the tractor to turn the compost regularly. We have many tanks for rain water that is utilised on the gardens and for washing and showering. We also have a bore which retrieves mineral water from the aquifer; this is used to pump water into the cattle troughs and don't they love it. We have a very large solar array on two roofs from which we draw our electricity although we do not rely solely on this for our energy needs - so there is always electricity even if the sun isn't shining. Our property is bordered on one side by the Tuross River and yes we have a swimming hole and sandy beach to enjoy. We are an organic hobby farm growing veggies & animals for ourselves & our families. Work includes gardening & making biochar. Accom for 2 in a self-contained cottage. Shared meals. Mixed diet. Vegetarians catered for. We are happy if WWOOFers want to cook. NSI. Initial stay 2 days, then negotiable. Short stays only. Yankabilly Island is a 75 acre rural property on the Darling River in Pomona. A billabong surrounds the property. Just 10 minutes from the small, two river (Murray/Darling) township of Wentworth NSW we are situated at the 'Gateway to Outback Australia'. Both the Victorian & South Australian borders are close by. The property boasts great river views, bushland, prolific birdlife (water & land), wildlife (goanna, echidna, emu, kangaroo, turtles etc.) and huge River Red Gums in a peaceful, natural environment. Since purchasing the property a few years ago some of our projects have included establishing a new house, renovating a shed into an artist studio, erecting fences, planting an orchard of 20+ fruit trees, vegetable & herb gardens for personal use, erecting a chicken coop and enclosing an area for a Zen Garden (yet to be landscaped). Our farm animals include sheep and cows. Accommodation: Stationary, comfortable, self contained 3 bedroom Houseboat which is moored on our Darling River frontage and includes Kitchen, TV/DVD, Bathroom, Toilet, A/C and heating. We lead an interesting and at times challenging life with much to do and learn. 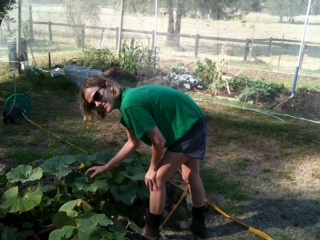 We are easy going and sincere and look forward to welcoming Wwoofers to our Yankabilly Island home. 10 beautiful acres at Belli Park, Qld, only 30 min from Noosa. We run horse facilitated learning programs for at risk youth and all abilities. The property is nestled in the valley before Mapleton State Forest and is home to 10 beautiful horses who support people to expand the quality of their lives by understanding what it means to be horse like. We offer nice accommodation and three lovely dogs to make you feel at home. Swan Lake is a sheep farm with 100 sheep on 50 acres, with a 1km frontage on to Sunday Creek. We also have a large 5 megalitre lake near the house, extensive ornamental garden, fruit trees & a large vegie patch. Work includes all aspects of gardening & general farm chores. S/C accom for 2 people. Easy access to Melbourne by train or via Hume Hwy. P/U from Seymour train station can be arranged. No children. Mixed diet. Non-smokers only. Prefer short stays of 3-5 days, longer by mutual agreement. A new-ish farm, in walking distance to Tallangatta township, supermarket & other facilities. Our property consists of 150 acres overlooking Lake Hume, made up of grazing land & bushland. Livestock incl a traditional Belted Galloway cattle stud, Wiltshire Horn sheep & rare poultry breeds. We are very relaxed & easy-going, meals will be with the family of 5 (4 children, aged 1-12) so you will be part of our family. You will experience many things such as cutting firewood, fencing, animal husbandry, growing vegetables & fruit, showing cattle, etc. We often exhibit & photograph at poultry & cattle shows. Accom is in a separate room in our home, with wireless ADSL internet, use of a laptop if you need it. Can P/U from Wodonga or Albury b.a. organic farm on the fringes of Nandewar range NSW were the mountains join the plains. growing heritage wheat varieties and running cattle sheep and horses. Small farm in the beautiful Capertee Valley. Since 1974 we have tried to produce most of our own food & are about 70% self sufficient. A great spot for bushwalking & bird watching. Work includes vegie garden & orchard maintenance, general farm work incl. milking cows, feeding & caring for chooks etc & some building work with sandstone. Accom for 2 within our home. Shared meals, mixed diet. Children b.a. Smoking outdoors only. Initial stay 3 days, then neg. Commonground is an intentional community committed to supporting social change. The Seymour property is used as a workshop & retreat venue for a variety of social change groups. We have developed a very attractive 95 acre property using permaculture principles. The main building which accommodates both groups & residents is made from mud bricks & recycled materials. We provide a stimulating opportunity to work with members of the community and are enthusiastic about our WWOOFers because we appreciate the opportunity for mutual exchange. (We have been WWOOF Hosts since 1993!) Work includes garden & orchard work, property & building maintenance, shared catering support. Vegetarian meals. NSI. Min stay 2 weeks. Easy 1 hour train from Southern Cross station in Melbourne to Seymour station and we are happy to pick you up. We are gradually restoring a neglected farm, a beautiful 180 acres bordering NP and close to beaches. Low-tech hard work & BD preparations are slowly producing results on our pastures. Our animals are part of the family - Josephine the milking cow, a small beef herd, chooks, ducks & sometimes pigs. Our vegie garden is established, the orchard in the making. Most of our food is produced on the farm, but fishing trips supplement our diet, which is meaty, tasty & healthy. Work incl work in pastures, weeding, raking, fencing, help in vegie garden & orchard, feeding animals and building projects. Own transport preferable to take advantage of the beautiful surrounding area. Caravan accom for a single or a couple. No children. Meat-based meals. Non-smokers only. Negotiable stays after first few days. Cannot take WWOOFers during winter.